Throughout the 20th century, several art exhibitions helped to change the course of art history by scandalizing, provoking and influencing both artists and art audiences alike. These fine art exhibitions were powerful, in part, due to the vision of the curators, who knew which themes and selection of artists, and the juxtaposition of their artworks, would help create historical exhibitions that would not be forgotten. A one-person exhibition was so powerful it changed the course of history. Paul Cézanne’s (1839–1906) retrospective at the Salon d'Automne in 1907, a year after his unexpected death, was so influential to younger artists, and especially to the Paris Avant-Garde including artists such as Picasso, that he is considered to be the father of Cubism and Modernism. The Salon d'Automne was originally founded by artists such as Pierre-Auguste Renoir, Georges Rouault, and Édouard Vuillard, as an edgier and daring alternative to the official Salon. The Sonderbund Exhibition in Cologne, Germany in 1912 canonized Modernism in Europe. The actual title of the show is Internationale Kunstausstellung des Sonderbundes Westdeutscher Kunstfreunde und Künstler (International Art Show of the Special Association of West German Art Lovers and Artists) but is referred to as the Sonderbund Exhibition. 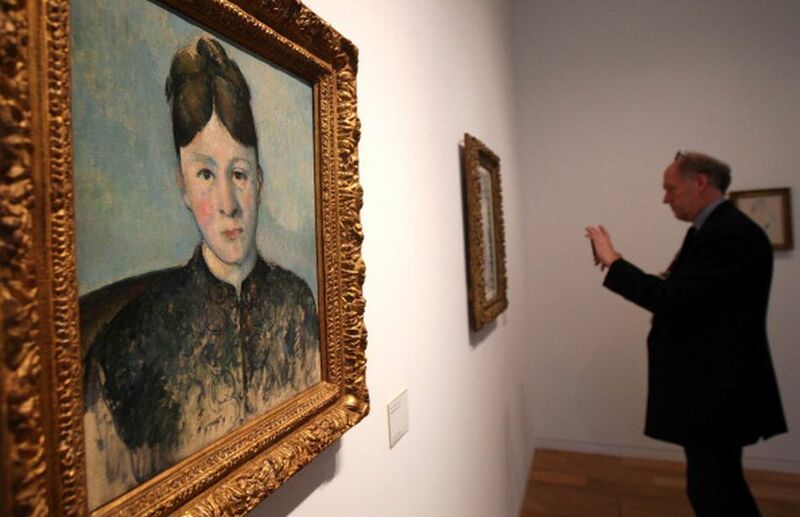 It included major works by artists such as Paul Cézanne, Edvard Munch, Paul Gauguin, Pablo Picasso, Egon Schiele, and Vincent van Gogh and included examples of Post-Impressionism to German Expressionism, and the Die Brücke and Der Blaue Reiter schools. The International Exhibition of Modern Art, commonly known as the Armory Show (as it took place at the 69th Infantry Regiment Armory), in New York City in 1913 brought Modern European art to the USA. The American art scene at that time was conservative and dominated by realism, with paintings focused on city scenes, landscapes, and portraits. Several American artists such as Walt Kuhn, Arthur B. Davies, Walter Pach, and William Glackens formed the Association for American Painters and Sculptors (AAPS) and organized the Armory Show, which introduced Cubism, Post-Impressionism, and Fauvism to American artists, and which became highly influential to the Abstract Expressionists of the 1940s. The painting by Marcel Duchamp titled scandalized the public and was the point of ridicule in the press, as one critic likened it to "an explosion in a shingle factory." First Russian Art Exhibition (Erste russische Kunstausstellung), which opened in Berlin in October 1922 featured Russian Constructivism and included works by El Lissitzky (who designed the catalog), Vladimir Tatlin, Olga Rosanova, Alexander Rodchenko, Kasimir Malevich, and Marc Chagall. The curators were artists: David Sterenberg, Nathan Altman, and Naum Gabo. The exhibition received critical acclaim, so the exhibition was extended to accommodate its growing audience. The London International Surrealist Exhibition in 1936 was curated by a group of artists and poets including Henry Moore, Paul Nash, Andre Bréton, Man Ray and Paul Éluard. The highly popular exhibition brought Surrealism to London. It included artwork by Max Ernst, Joan Miró, and Salvador Dalí, who delivered a lecture on Surrealism while wearing a diving suit​ and had to be rescued as he almost suffocated to death. The Sidney Janis Gallery organized the International Exhibition of the New Realists, which opened October 31, 1962, and was the first large scale exhibition to introduce Pop Art to the world. It included the work by American artists such as Wayne Thiebaud, Roy Lichtenstein, Andy Warhol, Claes Oldenburg, James Rosenquist, Robert Indiana, and by European artists such as Jean Tinguely, Yves Klein, Arman, Christo, Marisol, and Öyvind Fahlström. The exhibition showed the connection between the American Pop artists and the European Nouveaux Realistes. Some die-hard Abstract Expressionists such as Mark Rothko, Adolph Gottlieb, Philip Guston, and Robert Motherwell quit the gallery in protest, in what they saw as the art world transforming into crass commercialization. Swiss curator Harald Szeemann initiated the role of independent curator, as he was the first to work outside of the art institution mounting big survey shows. His 1969 exhibition Live in Your Head: When Attitudes Become Form (Works, Concepts, Processes, Situations, Information) included experimental, performance and conceptual art and featured various art movements such as Arte Povera, Anti-form, and Process Art. Artists such as Eva Hesse, Joseph Beuys, and Bruce Nauman were included. The controversial 1989 China Avant-Garde Exhibition at Beijing’s National Art Gallery in Beijing, organized by ten young art curators including Gao Minglu and Hou Hanru, displayed work by 186 artists, including Xu Bing, Huang Yong-Ping, ​and Wu Shanzhuan. This historical exhibition signaled the arrival of the contemporary Chinese art scene into the international art world. The police shut down the exhibition on opening day when the artist duo Tang Song and Xiao Lu shot a gun at their artwork. By the end of the 1980s, post-colonial theory was influencing the curatorial decisions of curators, so that art exhibitions were no longer dominated by Western white male artists, but exhibitions were becoming more inclusive, including the diversity of creative voices the world has to offer. This was evident in the 1989 Magiciens de la Terre (Magicians of the Earth) exhibition. Held at the Centre Pompidou and the Grande Halle in Paris and curated by Jean-Hubert Martin, the huge survey focused on Asian, African, Australian Aboriginal, and Latin American artists. documenta, spelt with a lower case D, was established in 1955, and usually takes place every 5 years in Kassel, Germany. For each edition, a notable international curator selects a theme and chooses the artists. documenta is one of the most prestigious and influential contemporary art exhibitions, which is why artists, curators, critics, and other arts professionals from all over the world visit and learn from it.